Infamous Barashed (7/8 Tune) * Flying Scotsman (Hornpipe) * Gadaffi’s Revenge (Hornpipe) * Lord Provost’s Hornpipe (Hornpipe) * Dod’s Tartan Punk Rock Trews (Hornpipe) * Intrepid Michelin Skymen (Hornpipe) * Alistair Fergus Ewan (Hornpipe) * Angus MacKenzie of Dumbarton (Hornpipe) * Coupit Yowe (Jig) * Gillian Chalmers’ Jig (Jig) * Jimmy Ward (Jig) * Tom Billy (Jig) * Price Of The Pig (Jig) * Gold Ring (Jig) * Abercairney Tom (Jig) * Kesh Jig (Jig) * Humours of Whiskey (Jig) * Barabel Phadruig (Patrick’s Annabel) (Jig) * Hag at the Churn (Jig) * Lark in the Morning (Jig) * Snug in the Blanket (Jig) * Paddy Clancy’s (Jig) * Langstrom’s Pony (Jig) * Grid (Jig) * Willie Ray (Jig) * Half Gill (Jig) * Pipe Major Ian G. Duncan (Jig) * Old Hag You Have Killed Me (Jig) * Bee in the Knickers (Jig) * Eavesdropper (Jig) * As I Was Kissed Yestereen (Jig) * Rambling Pitchfork (Jig) * Sporting Pitchfork (Jig) * Brady’s Jig (Jig) * Slalom Skier (Jig) * Blarney Pilgrim (Jig) * Gordon Cottage (March) * Eilidh Shaw (March) * Thomas Maxwell of Briarsbush (March) * Laxdale Cottage (March) * Isabel S. MacDonald (March) * Colonel Gifford (March) * MacFail from Bunessan (March) * Davie Ewens Welcome to Ravenswood (March) * Noelle Duncan (March) * Cuil House (March) * Nellie Stewart’s Farewell to Dervaig Post Office (March) * Atholl Highlanders’ March to Braemar Gathering (March) * Forgotten Winner (March) * Union Glen (March) * Stirling Brig (March) * Rose Of Allandale (March) * Farwell to Hawick (March) * Mhorag (March) * Sophie the Mink (Reel) * 3am in Edradour (Reel) * Masters and Apprentices (Reel) * Dirty Bee (Reel) * Andy Renwicks Ferret (Reel) * An Albannach (Reel) * Farewell to Erin (Reel) * Ca’ The Yowes (Reel) * Mrs MacLeod (Reel) * Congress Reel (Reel) * Swallow Tailed Coat (Reel) * International Piper (Reel) * Famous Ballymote (Reel) * Barmaid (Reel) * Footprints on the Water (Reel) * Rakish Paddy (Reel) * Martin Ainsborough’s Reel (Reel) * Humours of Tulla (Reel) * O’Rourke’s (Reel) * Scotch Mary (Reel) * Old Mountain Road (Reel) * Sisters’ Reel (Reel) * Silver Spear (Reel) * MacCrimmon Will Never Return (Slow Air) * Eileen Mary Connolly (Slow Air) * Idir Deighic Gus Breo (Slow Air) * Tibby (Slow Air) * Eriskay Song (Slow Air) * Braes Of Skreen (Slow Air) * Paddy’s Green Shamrock Shores (Slow Air) * Voodoo Chilli (Slow Air) * Mac’s Kilt (Strathspey) * Tha Mi Sgith (Strathspey). 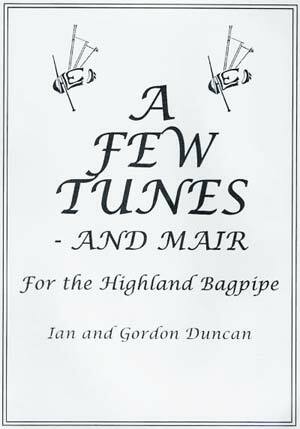 When Gordon Duncan was a member of the Vale Of Atholl Pipe Band, he and brother Ian Duncan released this collection of tunes in 1987. It has been re-published after a few years out-of-print. This contains many great Gordon tunes and arrangements, many of which featured in the selections of the Vale in those years, as well as in medleys of all the top bands and soloists. New tunes have also been added for this edition, and this classic collection is now available freshly typeset and in A4 format, with all the great tunes from the original.